Raising the action at the saddle is really just the reverse of lowering it, but it requires a bit more judgment and effort. 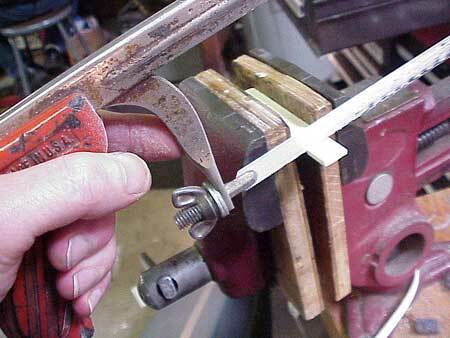 If the saddle only needs to be a little bit higher, it may be reasonable to lay a small shim underneath to raise it. Even though a shim is not integral with the saddle or even made of the same material, it is unlikely to have an adverse effect on tone. (In my opinion, of course.) If you look at the way the strings bear on the saddle you'll notice that there's a lot of forward thrust. 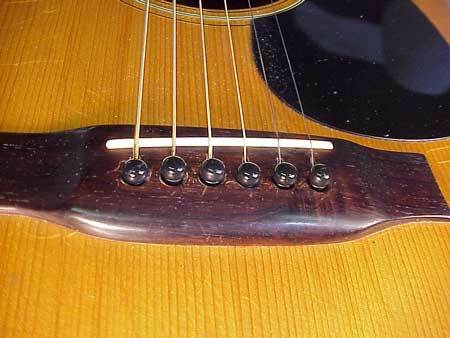 So, the saddle makes strong positive contact with the sides of the slot in which it rests. Shims frequently have an adverse effect on structural integrity, however. A higher saddle will obviously have a greater "forward" load on it as a result of string tension. 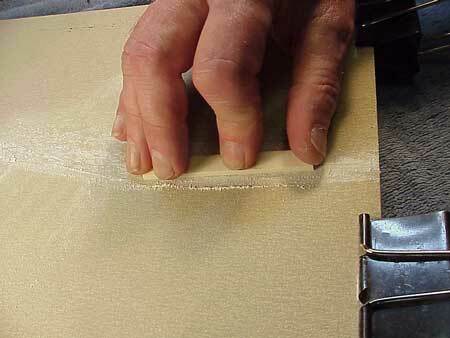 Thick shims underneath will reduce the saddle slot's effective depth, and its ability to hold the saddle upright. Most of the time, I prefer to raise the saddle by replacing it. That way, I'm assured of its strength. In this little article, I'll describe a method for making a new saddle with no specialized tools, as a reminder that it's a possible do-it-yourself job. 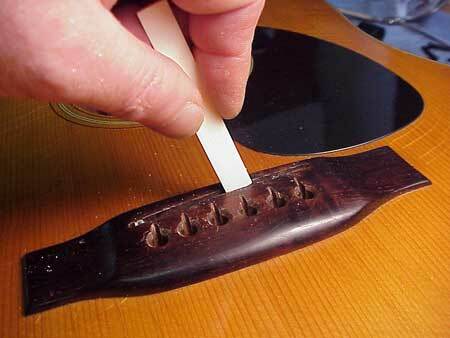 Old Martins, and some vintage style reissues, often have their saddles glued in place in a slot that cuts through at both ends. 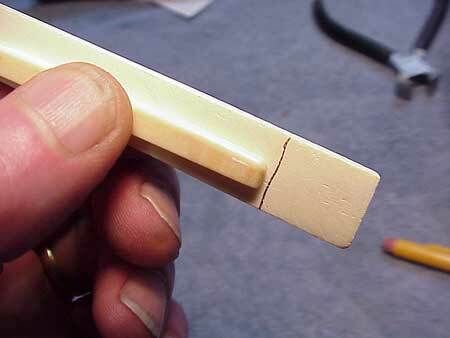 These are not easy to replace, and are best left to an experienced luthier. 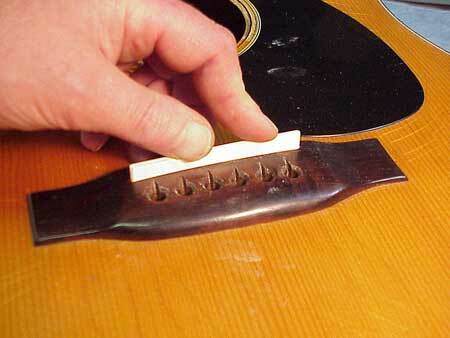 This guitar's action is quite a bit too low with the existing saddle, so I'll make a new one to raise the action. 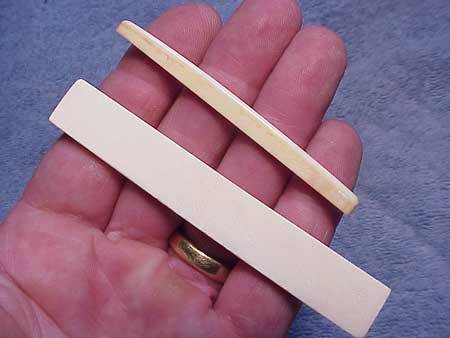 Bone is the most universally agreed upon natural material, being hard, dense, and economical. Same thing for the height. I'll mark the saddle blank to cut off excess, leaving more height than I'll need"
A flat counter top works just as well as a sanding surface. 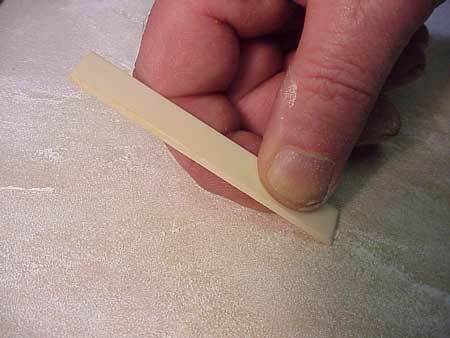 In fact, it's amazing how fast and easy it is to shape bone by rubbing it on sandpaper. Notice in the photo above, I'm holding the blank with as many fingers as possible. The idea is to keep the pressure distributed evenly to avoid bending or distorting the saddle as I sand. Once I have the blank flattened, I start trial fitting it into the saddle slot. Flipping saddle over to sand the opposite side, retrying the fit over and over, I manage to get the saddle to fit neatly into the slot. Once I get the blank to fit into the slot, I'll start to shape it. 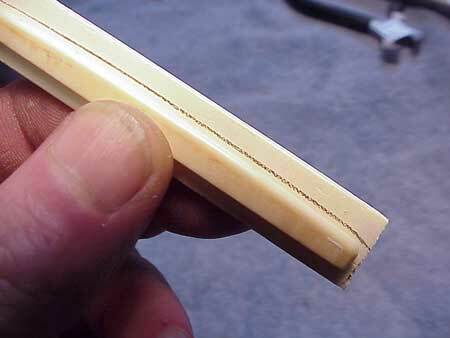 The ends of the slot are usually rounded because the slot was made by a rotary cutter. Now, it seems logical that I'd want to make the ends fit perfectly, but it turns out not to be all that necessary. If my saddle has nice approximate rounded ends and is the right length, it will fit so neatly into the slot that any tiny gaps at the ends will disappear. While it looks best to have the rounded ends exactly matching the curve of the rounded ends of the saddle slot, that's really just a matter of cosmetics. A little gap a the end of the saddle does no harm either structure or tone.